Three water cannon bought for the Met Police force for hundreds of thousands of pounds are set to be sold off - without ever being used. New London Mayor Sadiq Khan announced the move just under a year after Home Secretary Theresa May blocked the deployment of the equipment. Her ruling was hugely embarrassing for Mr Khan's predecessor Boris Johnson, who had authorised the purchase of three second-hand cannon for Scotland Yard from German police at a cost of more than £200,000 before they were cleared for use. One of the deals Boris Johnson managed to do with the Germans was to buy three water cannon. What I'm going to do is sell them and use the money for youth services. This shows the inability of Boris Johnson to get a good deal - second hand, paid almost a quarter of a million pounds. We want to get rid of them. 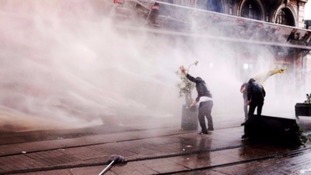 We are paying for storage facilities for these water cannon - that beggars belief. Mr Johnson faced fresh mocking over the episode earlier on Thursday as Mrs May launched her bid to succeed David Cameron as Tory leader. She said: "Boris negotiated in Europe. I seem to remember last time he did a deal with the Germans, he came back with three nearly-new water cannon." The Home Secretary announced in the Commons in July last year that she was refusing permission for police to deploy water cannon to control riots and serious public disorder. Mr Johnson admitted he disagreed with Mrs May's stance, while the Metropolitan Police expressed its "disappointment". Water cannon have never been used on the British mainland, although they have been deployed in Northern Ireland. Calls for police to have access to them first emerged in light of the riots in 2011. At the time use of the cannon was vetoed, Scotland Yard said they would be used for training.